September is Life Insurance Awareness Month, an industry-wide campaign that educates people about the importance of protecting their loved ones with life insurance. I have had first-hand experience of how coverage or lack of coverage can change families’ lives. As I think about the significance of this campaign, I recall my early years in the Navy as a division officer. Over a period of years, I had the unfortunate duty of having to communicate on multiple occasions the loss of a service member’s life to their spouse and family. Although the Navy had a strong program of bereavement support and an ombudsmen program to ensure families were able to connect with appropriate support resources, it never seemed to be enough to manage the shock they felt over the loss of their loved ones. It also created an almost immediate anxiety for their future financial security. Unfortunately, it was also the exception rather than the norm, where a service member had acquired appropriate insurance to provide financial protection for their families in the event of their death. On a personal level, it gave me a great appreciation for the need to plan for the unexpected. My wife and I took steps to ensure our family was protected financially. As I continued my career outside of the Navy, and began a career in healthcare, I continued to experience instances where either having life insurance or not having life insurance had a significant impact on the families of colleagues or friends. So I have always personally appreciated the importance of life insurance but had never really understood the challenge and importance of reaching the very large segment of our population whose families remain unprotected. My time at ExamOne has changed that. It has helped me recognize the sheer volume of life insurance applications that are processed in a single day, while also understanding there are many more people who haven’t yet applied for coverage. According to a recent LIMRA study, only 3 in 5 adults own life insurance – there’s a very large segment of our country, which doesn’t have adequate protection for their families. 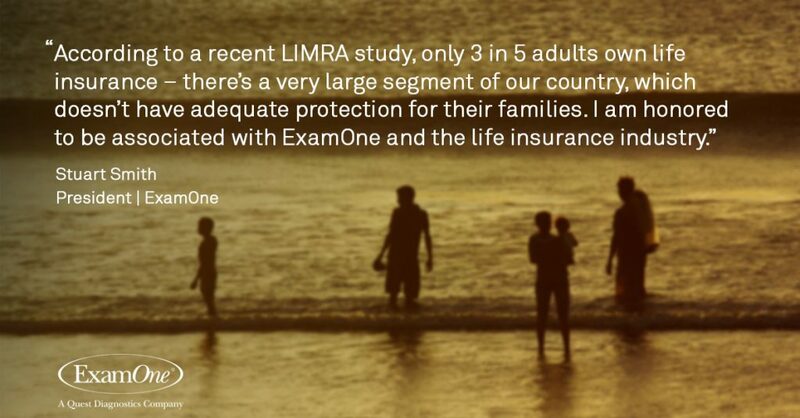 I am honored to be associated with ExamOne and the life insurance industry. We are proud to support an industry whose noble mission is to ensure all families are provided the financial security and peace of mind afforded by life insurance. Throughout September, our teams are focused on increasing awareness. We offer educational videos and materials that agents can give to their clients to highlight the value of life insurance and living a healthy lifestyle. These resources are available throughout the month via the ExamOne website, social media and email channels. On the home front, we will be hosting an employee walk – in coordination with our theme of “Taking Steps to Protect”. Our employees work very hard throughout the week and this walk is an opportunity for some of them to step away from their desk, take a healthy brisk walk and learn more about health, wellness and safety topics. While September is a special month-long recognition of the importance of life insurance, it’s crucial that we continue to provide our clients with insightful health data, behavioral data and personalized services throughout the year. This sense of purpose is why we show up to work each day. Our eagerness to help is something that won’t be limited to one month of awareness. I recognized the value of life insurance many years ago, and now I am fortunate to be part of an organization that supports the very important and noble mission of providing this protection to families on a daily basis. As a leading provider of decision support products for life insurers, we are excited to support one of the industry’s important initiatives – Life Insurance Awareness Month (LIAM). Today, nearly 60% of adults own some type of life insurance, but research shows the coverage they have may not be enough. More than one-third of all households say they would feel adverse financial impacts within a month if their primary wage earner died. To help applicants during the life insurance application process, our dedicated website, MyExamOne.com, offers resources to help consumers feel prepared and at ease while completing their life insurance journey. From frequently asked questions to accessing the results of their laboratory tests, applicants use this site to better understand what they can expect during the medical history interview and paramedical exam. Additionally, we are excited to help empower applicants with access to their personal health results. 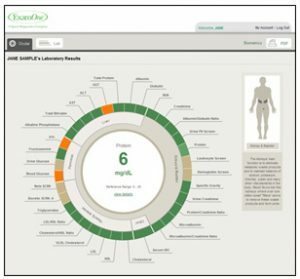 Through Inside Look® and our new Inside Wellness® reports, applicants receive their laboratory results after their paramedical exam is complete. * Each of our wellness reports have been recognized as game-changers in the industry and have been finalist of the Life Insurance Direct Marketing Association (LIDMA) Innovation Award. Inside Look was a finalist in 2017 this year Inside Wellness is a top finalist. From an interactive online platform to a comprehensive wellness report, applicants stay engaged and encouraged to live a healthier lifestyle. For more information on ExamOne.com and Life Insurance Awareness Month, you can visit https://www.examone.com/life-insurance/.